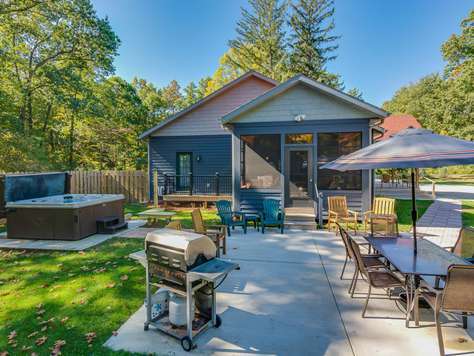 New Buffalo Michigan Vacation Rental: Log cabin on 6 secluded acres with breathtaking views of the Galien River, fire pit and outdoor hot tub. Sleeps up to 10 adults and 4 children. Max occupancy: 14. This property has 4 Queen(s), 1 Full(s), 2 Twin(s), 1 Pull Out Sofa(s), 1 Day Bed(s). This is a big home with all of the amenities situated in a beautiful wooded area overlooking a river. The deck is awesome with a hot tub and both gas and charcoal grills. It’s close to town and The Four Winds Casino, so plenty to do. My family really enjoyed the holiday and couldn’t ask for a better place to stay - only a little over an hour from Chicago. Had an amazing time at the Waya Den. Property is secluded yet easy to find. The house had all the amenities we needed and more than enough room for all of our guests. Everyone had a blast and we are already talking about holding our next celebration at the same place. Please do not hesitate considering this property for your next getaway, you won't regret it. We rented Waya because we needed space to accommodate our large family with a few babies. This house is ideal for family gatherings or groups. The large deck with view of the river below was just stunning and deer spotted. The yard for the kids to run was perfect. The spaces for everyone to retreat off worked so well and when it rained the downstairs screened room was great. Highly recommend this home! We came to the area for our son’s wedding. Eleven of us had plenty’ of room, comfortable beds, everything was very clean. We hope we can enjoy it another time when we aren’t so busy because the home has so much to offer. The staff was great to work with. I believe we were the first to use the brand new gas grill. the setting was private and peaceful. The house is beautiful! We found it to be so clean. We were comfortable to sit back and relax. There were things to do even though it was cold outside. Sleeping 14 comfortably. My family thoroughly enjoyed the weekend. There was tons on space for our large group of 9 adults and 4 kids. There was plenty to do both at the home and around the area. We had a blast! My only complaint is that I wish a larger table or a second table were on the top deck. It would have been nice to all eat dinners together in one location instead of splitting up. Even the large table inside wasn't big enough because there wasn't enough seating. Also, you might want to let people know about the bad water taste/smell so they can buy bottled water before they arrive. Other than that we loved everything!